What surprises, delights and dangers await the aviator that seeks to fly light aircraft throughout the United States? 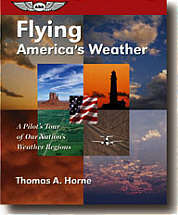 In this fascinating book, meteorologist, pilot, AOPA Pilot editor and author Tom Horne explains the climates and phenomena that can be found in every region of the U.S., in every season. With maps, photos and illuminating text, Horne explains what to expect, how to prepare for and how to enjoy the best and the worst of America's flying weather. Illustrated. 329 pages, paperback.